Do you know who "the Father of History" is? This book is about Herodotus who was an ancient Greek historian in the fifth century B.C. He was the first historian known to collect his data systematically and critically. He then arranged them into a historio-graphic narrative. This is a fascinating story about Herodotus with lovely illustrations for teenagers. 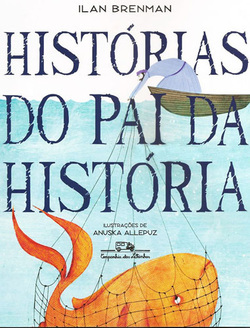 Recommended: To teenagers who think history is boring and have given up on the subject. You have nothing to lose in trying one more harmless book. It's not even that long. -Who is the Happiest Man in the World? -Who is the Most Cunning Man in the World? -Who is the Luckiest Man in the World? -Who is the Oldest Man in the World? The emperor, whose love of art made him become an actor, the president, who continued his speech even after being shot by a gun, a multi-talented man, who left 15,000 pages of memos, taxes on fireplaces and windows, medieval toothpaste made from urine, and more! A total of 38 special records of world history are in this book. In these 'real records' there are stories about scientists and artists that made life easier for people, a king with strange records that will last for generations, great and surprising adventures and challenges, as well as cultural heritages that shine brilliantly from all corners of the world and the traditional customs of each country. This book has picked out the juiciest bits of great incidents that make up history and tells them along with information of their historical context. It will make readers respond with exclamations of amazement and curiosity.